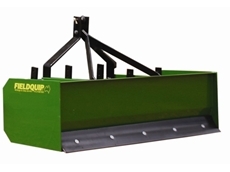 FarmQuip offers a range of Rhino Series Grader Blades that can easily Penetrate hard-packed, gravel, and frozen surfaces easily with less down pressure and horsepower. Bega Farm Supplies has been providing a wide range of pump and irrigation supplies, lown mowers, brush cutters, blowers and rainwater tanks for over 15 years. Thorne Engineering offer their innovative invention the Weedwakka, which eradicates the issues caused by conventional nylon cord brushcutter blades. 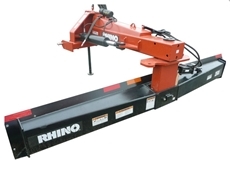 APW Imports are importers and distributors of BigDog Mowers ride on lawn mowers and zero-turn mowers, Bush Hog's zero-turn mowers, blades, boom mowers, finishing mowers, loaders, pluggers and rotary cutters and also Wright Commercial ride on mowers. 05/09/08 - Burando Hills provide harvesting and farming equipment from leading manufacturers across the world. The harvesting equipment includes carts, grain augers, chaser bins, chaff spreaders, hay conditioners, silos and swath rollers. 13/08/08 - The CP02125 model of bolt-on cast knife points, offered by McCoy Tillage, come in 130 millimetre lengths, 12 millimetre blade widths, slotted top holes and 7/16 inch or ½ inch plow bolts. 12/08/08 - The point and sweeps range, from McCoy Tillage, includes bolt-on points and knock-on points. 12/08/08 - TreeMax is involved in offering nursery products and gardening equipment. These include sieves, pruning tools and Polymat woven mats. The sieves from TreeMax come in two different models such as seed collecting and cleaning sieves. 11/08/08 - McCoy Tillage is a supplier of quality agricultural tillage equipment for customers in Australia. McCoy Tillage is a division of the Great Western Corporation, which commenced its business in 1930. 08/08/08 - Atom Industries are involved in offering drill attachments. Atom Industries have developed the Atom chainsaw drilling attachments. Recently, Atom Industries have introduced Atom automatic reverse gear auger-stop drill attachments as well. 06/08/08 - Leader Products offers a diverse range of sheep equipment. The Leader Power Parer range of sheep equipment functions at pressure conditions ranging from 75psi to 100psi. 04/08/08 - WesTrac Equipment offer a diverse range of work tools, engines and equipment. Caterpillar machines, distributed by WesTrac Equipment, are ideal for use in mining, forestry, construction, quarry, rental, local government and marine markets. 14/07/08 - Cutting Edges Equipment Parts provides effective Dynalock locking system designed to retain the 130 tooth system. 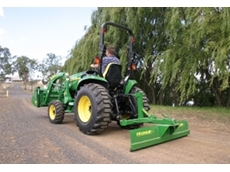 14/07/08 - Loxton Engineering Works offers cutting machines that are ideal for mowing, mulching, slashing and windrowing. These machines from Loxton Engineering Works are used for a wide range of applications.